The wars in Afghanistan and Iraq get quite a bit of coverage when it comes to talking about where the bulk of men and women serving are deploying to. While most are probably aware that service members have been involved in mitigating the situation in the Gulf, the integrated effort may not be top news. It truly is an integrated effort as about 1,900 defense department and associated personnel are deployed to the Gulf. The Coast Guard has been leading the federal response in the Gulf since April aided by the US Navy, the National Guard and the US Air Force. The Navy, has 19 skimmers and 29 tow boats in the Gulf to help soak up the oil. The Naval Sea Systems Command has oversight over those vessels and equipment. The National Guard is supporting local, state and federal authorities with aviation transportation, reconnaissance, security, hazardous materials training and other assets. 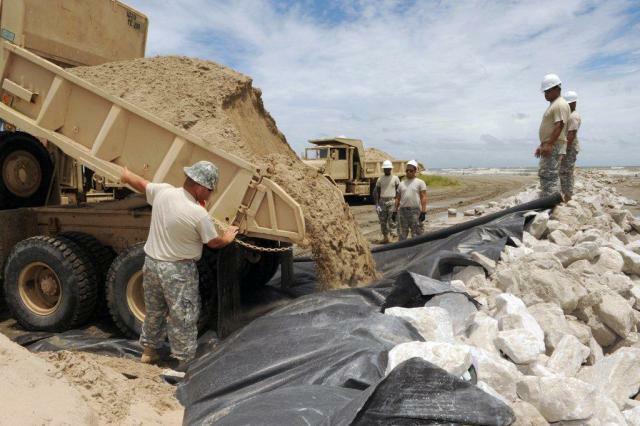 National Guardsmen also assisted BP in taking claims from Gulf residents affected by the spill. The Air Force’s 910th Air Wing out of Youngstown, Ohio, flew numerous sorties for about a month through May, spraying dispersing agents to neutralize the oil. The air wing redeployed last month. As always, Maja, we are in the business of bailing everyone out after disasters. Whether man made or natural. And it is not the primary mission. But we are better organized……for anything. This entry was posted on July 17, 2010 by majastevanovich in Military and Troops News and tagged Alabama, BP, coast line, Florida, Gulf, Louisiana, Military, Mississippi, National Guard, oil spill, US Air Force, US Navy.